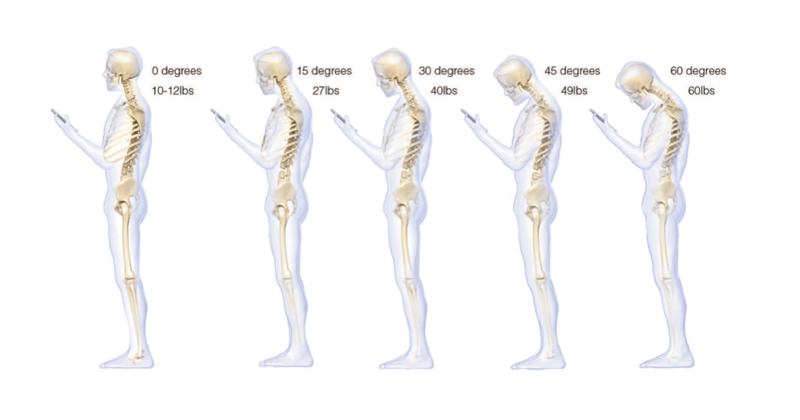 in Virtual Yoga Studio · Yoga "snacks"
A recent study published by Surgical Technology International concludes that when you look down at your cell phone to text, check email, or play a game the force applied to the neck is the equivalent of four adult-sized bowling balls, or 60 pounds (see image below). The forces are similar when you displace your head forward (the way you do when you look at your computer). Now think about how much time you spend in those positions every day. This kind of habitual movement patterns can lead to early wear, tear and degeneration. Today we feature a short simple chair yoga practice that will help you release muscle tension in the neck and upper back and realign the position of the head to take the load off the spine. It can also help you clear your head and focus. You can do this practice anytime, several times a day, if you want to. Just move your chair away from the desk and get going! I really like the tips you give. Thank you very much. Thank you Wanjira! Glad to here you like it! This is great, I’ve been asked to teach 45 min ‘office’ yoga sessions at a company, so in regular clothing mostly in a chair. I was already thinking of shoulder tension release movements so this is super helpful! Thank you —lovely, functional practice!! Love the kelp image! It was so fun and peaceful! I think I will be a kelp all the time! Previous story Myths about benefits of yoga poses – how much truth is there? How do you know what a yoga pose is meant to accomplish? Vital Vagus: What is the vagus nerve and what does it do?